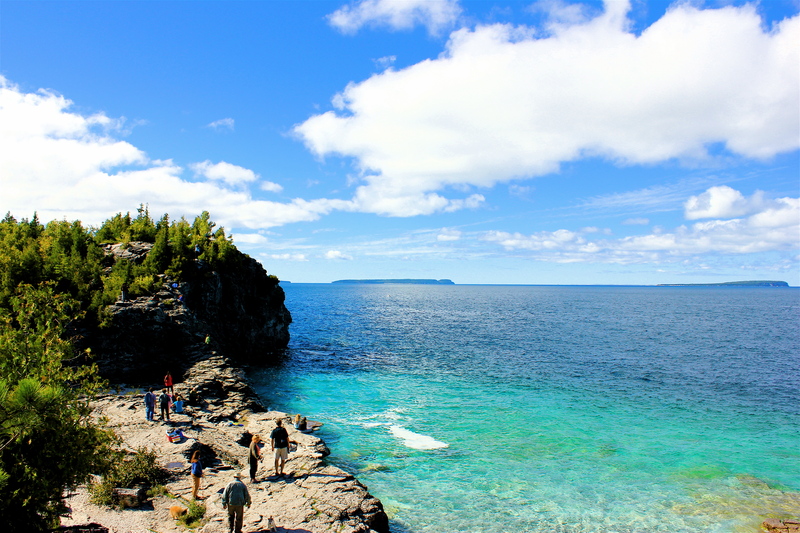 In the last weekend of August my wife and I spent a soggy week camping at Bruce Peninsula National Park with friends. We had been once before, years earlier, with another couple I knew from school. Hiking along the Bruce Trail we stumbled upon the Grotto, an oasis of turquoise water and sharp, grey rock jutting into Georgian Bay. Having never been to the park before, we thought we had stumbled upon some vaguely secret cove known only to those who venture off the beaten path. In this case, the Bruce Trail. Not so. Fast forward a few years to late August and our new camping friends, one of whom grew up nearby and vacationed in the park since childhood, led us on a walk to the Grotto where we would spend the afternoon swimming. No secret garden on the rugged coast, the National Park signage pointed anyone and everyone in the park towards the well-worn watering hole. Travellers flocked, it seemed, just to change behind towels held up by friends between rock formations to descend into the cave and swim among the snorkelers, scuba divers and day trippers. Suddenly, over a lunch of cheese strings, jerky and crackers, we heard the familiar whine of a low-flying aircraft, the repetitive whinnnnnnnnnnn of a small drone. I looked up. Sure enough, there, flying thirty or feet in the air out over the water, above the sunbathers and swimmers and families and lovers and dogs flew a four-propellered white drone with a small camera attached to its belly. I slinked further into the rock I was leaning on, sinking as deep as I it would let me. “That’s gross,” I said, motioning to the flying surveillance. I’m on vacation, I thought — I’m wearing the same pants I was three days ago, my shirt has sunscreen stains on it; I smell, not that the drone could detect that. Right? But beyond my camping hygienic deficiencies was the simple fact that here we were, in one of the most beautiful natural places southern Ontario has to offer, and the moment, such as it was, had been somehow lessened, tainted by the whinnnnnnnn-ing of the latest tourist ticket to change the vacation-photo-game since the Selfie Stick. It reminded every one of us of the world outside the Grotto, the office obligations, the deadlines and responsibilities we had shed in coming to the park. It reminded me, I felt, to check my phone, something I hadn’t wanted to do in days. Funny enough, that same day, Stephanie Rosenbloom, writing for the New York Times, penned The Selfie-Drone: Invasion of the Vacation Snatchers, a spirited look at how places are striving to make drone-less vacations a permanent fixture. The full article is well worth the read. And, if the idea of expanding no-drone-zones into Canada’s National Parks is ever considered, the powers that be have my vote.